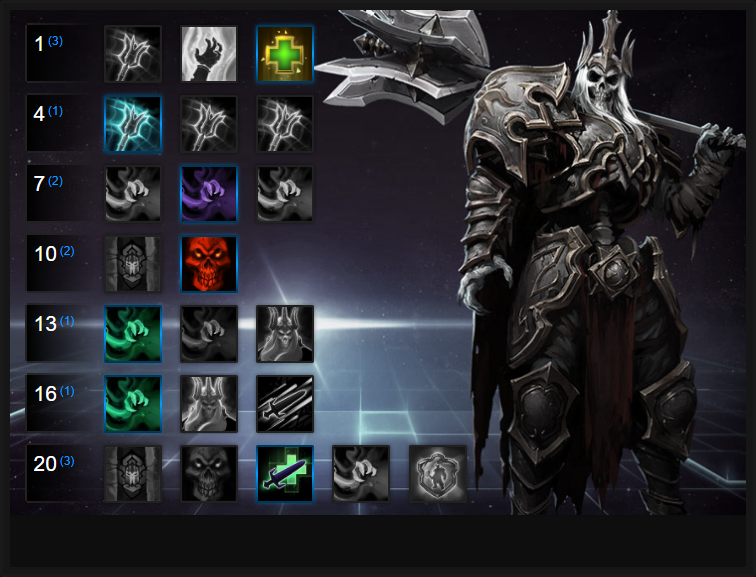 In this Leoric Build Guide, we provide an overview of his strengths, abilities, talents and matchups. Leoric is a painfully slow but powerful Hero who's capable of pushing lanes, slowing large groups of enemies and generally being a nuisance. His Trait allows him to return back to the battlefield quickly and his Entomb heroic offers an incredible means of keeping enemies in place. Despite this, he's hard to play well and his lack of attack speed requires that the individual playing him knows exactly when to land their hits. Unlike other Warrior Heroes, Leoric has little crowd control outside of his single slow, meaning that his value as a warrior is based on his self sustain, ability to body block and slow large groups of opponents. He's capable of dealing high damage to enemy Heroes and based on the current Meta, is a really strong counter to most other Warriors. Alongside his lack of crowd control, Leoric has a very slow attack speed (the slowest in the game) so his prescence is only felt through Drain Hope and Skeletal Swing. Having said that, if you land both of those attacks successfully, you're going to cause the opposition some serious problems to the point where they'll have to scatter or retreat. What also separates Leoric from other warriors is the fact that his Undying Trait allows him to return to the battle much faster after he's died. In a lengthy team fight, this can prove invaluable. As far as his Heroic skills are concerned, both are good with one (Entomb) offering a formidable wall that your team can use to comfortably spike the opposing team, or March of the Black King for amazing self sustain and high damage. Undying (Q) - Undying allows Leoric to turn into a Wraith when he dies. As a Wraith, he can use two abilities (Ghastly Swing and Drain Essence) and can freely move around the battleground. Using Drain Essence allows him to revive quicker, while Ghastly Swing will slow opponents. The primary purpose of Undying and its true value is Leoric's ability to reposition on death, slow the opposition and when his death timer is up, and he becomes a physical form, to then fight again. What I must stress with Undying is the fact that you Leoric isn't Murky 2.0. You should see Undying as a benefit to dying over other Heroes, not something to aim for. Leoric might be stronger than other Heroes when dead, but don't make dying your aim. Ghastly Swing (Q) - Ghastly Swing can only be used when Undying and allows Leoric to slow enemy Heroes by 40%. It has a lengthy cooldown and it's primary purpose is to be a nuisance while dead, but to also allow you to land Drain Essence easier. Try to use Ghastly Swing on squishy targets or on the enemy team when they're trying to escape. Drain Essence (E) - Acting similarly to Drain Hope, Drain Essence allows Leoric to gain health whilst Undying. It's imperative that you land this ability every time so that your death timer is significantly reduced. Be sure to slow enemies first, be as near to them as possible, and then use it. Similarly to Drain Hope, you will have to stay in range of whomever you have chained to, to maximise its use. As a final tip, Drain Essence during lower levels can quickly bring you back from the dead so be sure to position yourself on the edge of any fight as if you return from the dead amongst the enemy team, you'll be killed quickly. Skeletal Swing (Q) - Skeletal Swing is Leoric's only form of crowd control and it slows for a significant amount (40%). What's particularly strong about this ability is the fact the cooldown and mana cost is reduced by 50% when you hit a Hero. It's still great for clearing a minion wave, but considering your basic attacks now cleave, it's not absolutely neccesary. If you can, try to save it for team-fights so that you can constantly slow the opposing team. Drain Hope (W) - Dragin Hope is one of my favorite abilities in Heroes of the Storm because it's both aggresive and defensive. Drain Hope requires that you remain chained to an opponent in order to drain health from them, whilst dealing damage. The radius on the chain is large so if someone does want to break it, they have to run quite some distance. The health return is significant and besides a few Heroes (notably Ilidan or Butcher), Drain Hope provides enough self sustain to stay in lane for long periods. It allows you to easily counter a solo-laner to the point where you can comfortably push them back before attacking towers. The one downside to Drain Hope is that it can only be used on enemy Heroes and if you miss, you lose all potential to keep yourself alive. Wraith Walk (E) - Wraith Walk is primarily a defensive ability, as it quickly allows you to exit combat. When you trigger it, you'll instantly turn into a Wraith and spectral walk to wherever you want. When you're a Wraith, your body will remain where you activate the ability and as such, you'll remain vulnerable to damage. I tend to use Wraith Walk at around 20% health and if my body gets too low, I'll end the ability early. More often than not, you'll have still gained a considerable distance away from your enemies thanks to the 50% movement speed. If you're high health and your opponent is low but escaping, you can use Wraith Walk very aggressively to hunt them down. Simply use the ability as they begin to flee and you'll quickly catch them up for a Skeletal Swing > Drain Hope spike. Entomb (R) - is an amazing Heroic ability because it provides a barrier that prevents players from escaping. During early levels (especially pre-16) it's formidable because players have few means to escape it. It's best to try to use Entomb on a large group of enemies as the tomb is fairly wide. The one downside to Entomb is the fact it's only wide enough to fit one person in the entrance and if that's you, your melee allies will struggle to hit the trapped targets. With a ranged heavy composition, it's formidable at allowing for team spikes (especially with Valla, Kael'thas and Jaina). You can also use Entomb defensivly as you run away as it'll block a narrow path entirely. March of the Black King (R) - If you're pursuing a damage orientated build revolving around self sustain, March of the Black King is incredible. Paired with Wraith Walk (you move through enemies, turn around and use March of the Black King) it can be very powerful. If you can land a Skeletal Swing and follow it up with MotBK, there's every chance you'll not only deal significant damage but provide yourself with a huge amount of health at the same time. Just be conscious of where you aim your telegraph, as once you begin to move, you cannot change direction. The more enemies you hit, the more health you'll return to yourself. A self heal that you can use alongside Drain Hope, Ossein Renewal heals for 30% of your maximum life over 5 seconds. It's significant and it'll keep you alive for long periods of time. Although the cooldown is long (120 seconds), this can be reduced by 20 seconds per Regeneration Globe you collect. As long as you're rotating lanes, or securing mercenary camps, you should always have this available. By default, Skeletal Swing has a relatively short range. Increasing this by 25% with Ghastly Reach allows Leoric to slow his opponent's easier, without needing to dive as deep. It's also particularly useful when chasing the enemy team, as it ensures if you do pursue them with Wraith Walk, you can stop a little sooner and cast Skeletal Swing to slow them down (without leaving your team too far behind). When Drain Hope is active, Leoric is slowed by 20%. This can result in players easily escaping your tether, and significantly limiting your healing and damage potential. Drain Momentum removes the movement penalty of Drain Hope, but also allows you to gain +30% movement speed upon Drain Hope lasting its full duration. It's fantastic for escaping, or hunting players down. March of the Black King is great for self sustain as it heals you as well as dealing damage to opponents. It'll keep you alive and if used when enemies are low health, finish a few off. It's difficult to land, but as long as you're in amongst the enemy team and the fact you're Unstoppable ensures you'll heal yourself a significant amount, while dispersing the enemy. Variable: Entomb is an amazing heroic ability that allows your team to comfortably spike one or several Heroes caught in the wall. It's pretty easy to land and unless opponents teleport out of it, they'll take a huge amount of damage. Best of all, its cooldown is pretty low at 50 seconds. I'd only take this if you have a very AOE heavy composition. If you're pursuing a self sustaining build, Unyielding Despair is the go-to Talent. The fact your Drain Hope has its cooldown reduced by 0.5 seconds for every 1 second Drain Hope is active, it offers Leoric much more sustain. If you also complete Drain Hope's duration, the cooldown of it is lowered by a further 2 seconds. In total, Unyielding Despair brings your Drain Hope down from 11, to 7 seconds on cooldown. Crushing Hope causes damage based on 15% of a heroes maximum health every time Drain Hope ends. It's an amazing amount of instant damage and at level 16 (when you can reduce the cooldown of Drain Hope) allows for constant high damage burst against front-line heroes. Your basic attacks will now deal 2.5% bonus damage based on your enemies maximum health and then convert this to healing. The healing value is doubled for Leoric. Effectively, it's a mini heal over time which pairs amazingly well with your basic attack chain. Variable: Just because you're already pretty squishy outside of Drain Hope, Shroud of the Dead King makes an enormous difference to your survivability. You can now last a heck of a lot longer. This list of tips and tricks are just a handful of things we think will help your Leoricplay. We'll continue to add to the list as required and if you have any tips you'd like to share, let us know in the comments below and we'll place them here. Illidan: His mobility and evades make him a challenge for Leoric. His damage and if he uses an Heroic will also leave you in trouble. Kerrigan: Staying out of her range is important because if she catches you with Primal Grasp > Impaling Blades you're going to take a large amount of damage even if you can heal yourself afterwards. Johanna: Her shielding combined with her pull, slow and blind make her particularly annoying to fight against and a good counter to Leoric. Nova: Only really a threat due to her range, she can comfortably make you vulnerable and deal huge damage before you even get close. She can't kill you, but she can help her team do it. The Butcher: His charge, Lamb to the Slaughter or self heal can rip you up in seconds. Even if you try to escape, he'll have hurt you enough that you can't rejoin the fight any time soon. Thrall: If he gets the drop on you with his root, you're going to take huge damage. Fortunately even if you are rooted, you can use Wraith Walk to move away. Just avoid his Windfury. Valla: Her Vault makes her tough to land your Displacement Grenade and her sustain damage can cause real problems, especially with the extended reach of Hunger Arrow. Raynor: His range combined with his knockback makes Raynor a very annoying Hero to fight against. Late game his auto attack damage is also incredibly high. This list of tips and tricks are just a handful of things we think will help your Leoric play. We'll continue to add to the list as required and if you have any tips you'd like to share, let us know in the comments below and we'll place them here. 1. When you're dead and in Wraith form, you can teleport back to base for a safe revive. 2. Also when dead, you can use Ossein Renewal to revive quicker. 3. Only when you die, do you gain access to both Wraith forms of Skeletal Swing and Drain Hope. One is to help be a nuisance against the enemy team (Skeletal Swing becomes Ghastly Swing), and the other is to revive quicker (Drain Hope becomes Drain Essence). 4. Remember that you will revive wherever your Wraith form is and before you regain your life, you'll be stationary for a brief moment. Be sure to be somewhere safe when you respawn. 5. Skeletal Swing is still great at softening up a minion wave, especially if it's particularly large. It's strongest however when used against Heroes as it then refunds half the mana cost, while having a 50% reduced cooldown. 6. Try to always land Skeletal Swing against squishy Heroes who have high value. You want them slowed so your team can collapse on them. 7. Don't forget that when you Wraith Walk, your body remains stationary and can still take damage. If you're about to die (your body), end Wraith Walk early by pressing the ability again. 8. Wraith Walk can travel faster than a mount. If you need to catch someone, chase them down before landing Skeletal Swing against them. 9. Wraith Walk allows Leoric to pass through all players. Don't be worried about the enemy body-blocking you. 10. Use Wraith Walk offensively if you know you can survive the push. Wraith Walk > Skeletal Swing > Drain Hope is a great burst combo. 11. Wraith Walk is brilliant for setting up a reverse March of the Mad King. Simply Wraith Walk through the enemy, turn around and use the Heroic. Your enemy won't expect it (often) and you'll deal huge damage on your way back to your party. 12. When you're dead and in Wraith form, you can teleport back to base for a safe revive. 13. You might attack slowly, but your attacks hit hard. Your first two basic attacks will cleave, your third will deal critical damage. Aim for squishy targets like Kael and Valla to pressure them early. 14. Try to always cast Drain Hope on a front-line Hero who's less likely to run away from you. At the very least this will ensure you get full value from the health return. 15. When you've dived into the enemies back-line, aim Drain Hope on a high value target. It'll force them to retreat, or if they stay they'll take high damage. 16. Try to cast Drain Hope close-up. If you miss, your sustain plummets.